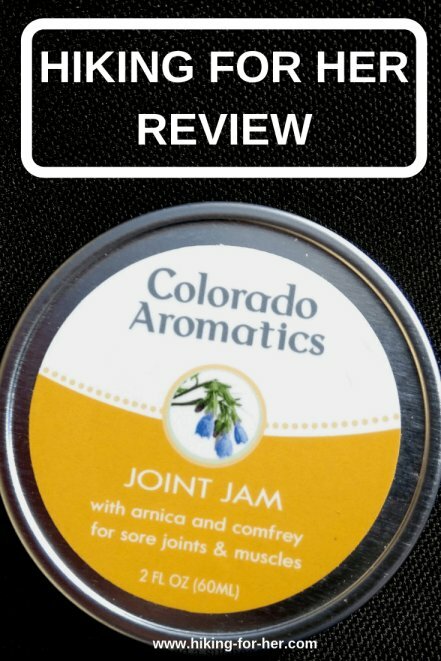 This Colorado Aromatics Joint Jam review might help if you are looking for a natural remedy for sore muscles and sore joints after your hike. There is no affiliate relationship between Hiking For Her and Colorado Aromatics. Joint Jam was provided free of charge. All of the photos and opinions belong to Hiking For Her, for the purpose of giving you information you can use for hiking self care. What you're about to read is personal experience with using this product for relief from achy joints. No medical advice is intended. Time to get into the details! And that means checking out what goes into Joint Jam. The essential oils include eucalyptus and rosemary. Note the arnica & comfrey, and keep reading! Perhaps you're already familiar with using arnica for relief from sore muscles, or to help with healing sports injuries. Turns out that in additional to centuries of practical knowledge, there is a lot of recent clinical evidence for using arnica and comfrey to combat the aches and pains of the hiking life. A study published in PubMed discusses how topical arnica can be used for knee osteoarthritis to eliminate stiffness and pain. "Topical comfrey preparations are a valuable therapy option for the treatment of painful muscles and joints." It's used topically to provide a cooling sensation, as an antidote to the "hotness" of inflammation. It's also known to increase blood flow to an area, bringing in oxygenated blood with its associated nutrients and healing components. Read what the National Institutes of Health has to say about menthol here. This easy to apply Joint Jam smells like a cross between a summer breeze wafting over a flower meadow and a menthol ointment. The odor fades quickly after you apply it. Because of all of the oils and butters (lipids), it feels great as you rub it into your dry skin. This metal tin fits nicely in your hand. The lid comes off easily. Joint Jam caught my eye because of the reality of osteoarthritis. Sore thumb joints make holding trekking poles for long periods of time problematic. Sore hands also make it tough to open up water bottles, tear open hiking snack wrappers, adjust backpack straps, and all of the other hand motions a hiker makes during a hike. My initial plan was to apply Joint Jam to one thumb, but not the other one, for five days in a row. But it only took me three days to abandon the plan and apply it to both thumb joints. Yes, there was a noticeable difference between the left and right thumb joints. While the relief was not complete, or as dramatic as over the counter medications in easing the usual dull pain and stiffness, I definitely felt a difference. More mobility because I wasn't dreading the pain! For these reasons, I will continue to use this herbal application as hiking season ramps up and I'm dealing with sore muscles on top of sore hand joints. Open this up and start smiling! This metal container is filled to the top, and is thus too heavy for a backpacking trip. Scoop some out into a smaller plastic container. Don't bring this topical "jam" along on trips into bear country unless you are committed to putting it into your bear canister or bear bag each and every evening. And be careful to apply it only during the day, and to wash it off before crawling into your tent in the evening. Its odor will smell delicious to a curious bear. And probably taste mighty good, too, due to the rich oils. Don't put it on popped blisters or other open wounds. Read about blister care here. Colorado Aromatics is a woman led company, and grows its own herbs in (guess which state). Dr. Cindy Jones, CEO and Founder, has a lot of experience and knowledge in choosing the right plants for anti-inflammatory products for outdoorsy women. So that ingredient list you just saw? It was chosen carefully by Dr. Jones, from the historical database of medicinal plants blended with Western clinical science, with a nod to great skin care for sun exposed women. Read more about her & her team here. It's always fun to try something new in the fight against stiff, sore muscles and joints after a hike. And the chance to make my sore thumbs a bit happier, sure, sign me up!! I'm happy to report that Joint Jam is now part of the post hike repertoire at Hiking For Her. And in fact, it's part of my morning ritual on the days when my thumbs are throbbing. Stay tuned for your chance to win your own Joint Jam in May 2018. Bookmark this page & check back for the link to the giveaway page. You might also enjoy Colorado Aromatics Sole Pleasure Foot Butter as part of your hiking self care routine. Hiking For Her reviews it here.